Is it just me or is it hard to focus on just one thing at a time these days? We're pulled in five different directions, doing three things at once, while two different electronics chirp, beep and buzz at us with reminders and notifications. As part of my goals for the year I want to live a life of less. I want less of what I don't need so I can enjoy what I have more. I'm working on a minimalist journey. This is happening in multiple ways. I'm getting rid of obligations that don't serve me, I'm getting rid of physical items from our home that we no longer use or need, and I'm simplifying my online life. Unsubscribe from unwanted e-mails. Making a quick count, I manage four e-mail addresses every day and more than that on occasion. My inbox is one of the most cluttered spaces in my life. I am unsubscribing from e-mail lists from places that I no longer engage, or retailers where I rarely shop. It's very nice to see a manageable number of unread e-mails and not waste time deleting things that don't interest me. Clean up your Facebook groups. For some reason Facebook allows your friends to add you into Facebook groups without seeking permission. The consequence is consistent notification of postings in a place you didn't opt-in to. Don't feel bad about ditching a group you aren't interested in, even if a good friend invites you. Clean your work area at the end of each week. This was actually just suggested to me recently and I love it. It is understandable that you don't always have time to clean up your desk as the week gets hectic with deadlines and responsibilities. At the end of each week before you retire into your weekend clean and straighten up your work area. This sets you up to come in to a clean space on Monday morning which will help with your mood and productivity. Clean out your fridge each week. One of my goals is to get better with eating leftovers. I'm not quite there yet, so I often have one serving of a meal leftover longer than it is edible. Cleaning out your fridge weekly keeps things neat and organized. This makes sure you can see what you have available so you remember to eat them and don't double purchase things. Clutter - whether digital, physical, or mental - does nothing to serve you. I'm looking forward to getting rid of more excess so I can always be close to what is important. Live more with less. 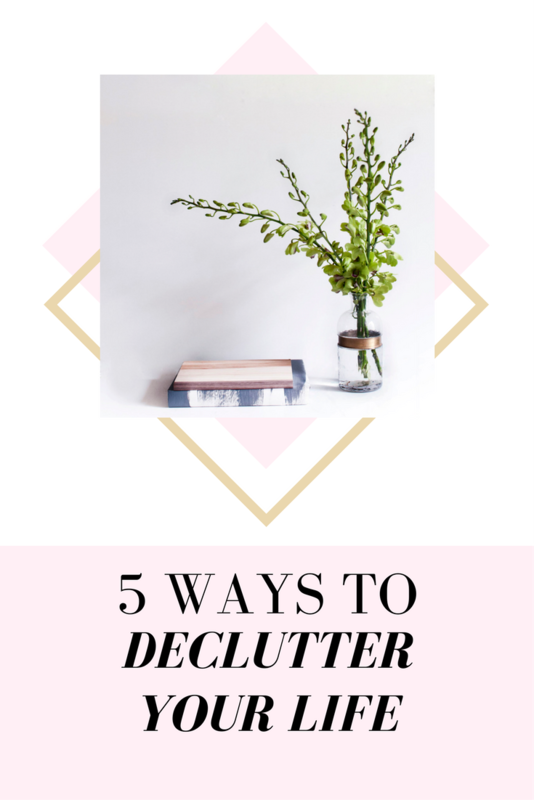 These are very good, practical tips for decluttering. As decluttering is often associated with physical things, we often fail to realize that other things stack up too! During the holidays, I realized that I was getting at least 200+ emails/day... That was when I started unsubscribing from a lot of things that I normally delete anyway! Facebook groups and the FRIDGE will be my next tasks! Thanks for tips, LaNeshe!! You're welcome! Yea the emails easily pile up. And they can lead to unnecessary spending. I NEED to get better at the refrigerator thing! Great tips. I seriously JUST left a ton of groups my friends invited me too and it feels so much better! These are great tips! I appreciate my friends who ASK before adding me to groups. Oh thank you for the reminder about unsubscribing to emails. Sometimes I don't even know how I got to that list in the first place! And yes to cleaning out the fridge. We don't want nasty things starting to smell in there!! People have sneaky ways of getting your emails! I definitely need to work on the email one. I agree about cleaning the fridge every week! I do it every week when I get new groceries and it really helps to keep me organized. Yea that's be the best time. Make room for the new! This is great advice! I really, really need to do at least the first one . . . and the last two!!! I've recently been de-cluttering my social media. email etc because as a writer it takes away from writing time having to deal with all these unnecessary things. Great article. Thank you! It can all get very distracting. These are great tips! For email decluttering, I use UnrollMe, so that I still have access to some of the mailing lists I ocassionally use. It bundles them all in one place, and also makes it easy to unsubscribe to a lot of them in one go! Oh I have to check that out. I am definitely due for a makeup cleanup!